By Richard W. Etulain. Norman: University of Oklahoma Press, 2015. Pp. xii + 263. Cloth. $34.95. ISBN 978-0-8061-4871-7. Richard W. Etulain impressed readers of American biography in general and those of the American Wild West in particular with his recent biography The Life and Legends of Calamity Jane (Norman, 2014). With this work the reader is provided with a bibliography of the major sources for the frontier woman who has become one of the best known women of the American frontier, Martha Canary. One does not often find a reference book gripping, which may be slightly too strong a word, but this is a study which is fascinating, not only in its revelation of the quantity of writing which has been done on Calamity Jane, but the thoroughness of Etulain’s research. He admits that this does not contain every single work, whether it is a dime novel of the 1880s and 1890s, or a newspaper clipping of one or two paragraphs, but it is close to that remarkable achievement. Etulain first satisfies the reader with a brief biography of the woman; most every westerner is familiar with this woman’s life but even if you know every single fact about her, this twelve page essay is so well written, so enjoyable to read, it should not be ignored. This brief biography precedes the second chapter of the book, dealing with how the plain life became legendary. In both, his handling of the language is to be envied. But this is a reference book. Etulain divides the data into ten sections: (1) Bibliographies and Reference Volumes; (2) Manuscript Collections and Manuscripts; (3) Legal Documents; (4) Newspaper Articles during Calamity’s Lifetime; (5) Newspaper Articles after Calamity’s Death; (6) Books and Pamphlets; (7) Essays; (8) Dime Novels and Commentaries; (9) Other Fiction, Literary Works and Criticism and (10) Films and Cinematic Criticism. Then we are given a collection of most of the photographs of Calamity, including two versions of her in her casket. Then follows the challenge set out for other researchers – the “Unfinished Business” identifying areas where we know so very little, but Etulain believes, there must be additional documentation to be found. Will a complete biography of Calamity Jane ever be written? Perhaps, but only after much additional research is undertaken. For example, virtually nothing is known for sure about Jane’s grandparents, her parents, her siblings, and even her numerous “husbands.” What happened to those individuals? And although we know Jane spent many a night in jail, thanks to her drunkenness and unsocial behavior, we have very few actual records which had to exist at the time. Were they all lost or destroyed? Although many researchers and historians have left their papers to a university or historical society, they remain in many instances in an archive, waiting to be organized for researchers. 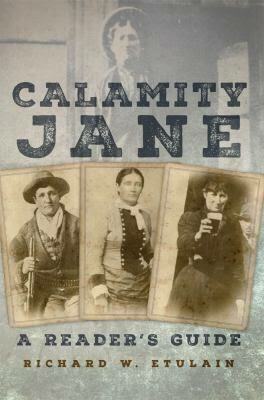 Although it is interesting to study the numerous photographs of Calamity, this book is lacking in the following: there is a reference to an 1876-77 photograph of Jane, seated, with a Stevens Buggy gun. The version included here is of her taken at the same time only standing. This would have been an excellent opportunity to show both images. And if there are more images of Jane why were they not included? One may argue that the numerous photographs in A Reader’s Guide suffice, and accomplish their purpose, but this reviewer feels there is a need for a book to be published which includes all the known images of this important woman. Etulain, the author or editor of more than 50 books, is Professor Emeritus of History and former director of the Center for the American West at the University of New Mexico.